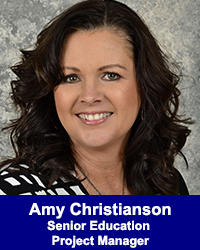 Amy Christianson, Senior Education Project Manager - California Consulting, INC.
Amy joined California Consulting, LLC in December 2011 as a Senior Consultant responsible for education grants. Amy brings with her 15+ years of grant writing experience as a professional grant writer. She has served as the grant writer for the Butte County Office of Education and the Chico Unified School District among other public entities. Specializing in federal, state, and private foundation education grants Amy has written 10 Healthy Start applications and had 8 funded for a total of $2.4 million in awards. She also wrote a Healthy Outreach grant for $300k that was funded and a grant to fund a Dental van for $300k that was funded. As well, Amy has written 15 BASNLP/ASES applications and 13 were funded for a total of $12 million in awards during her career. She has experience with Carol M. White PEP grants, Community College Connections grants, Early Childhood Grant for Pre-schools, and others. She has served as a Grant Reviewer for the California Department of Education for the 21st Century grant and during her career has written six 21st Century applications 4 of which were funded totaling $6 million. Amy’s expertise in the education arena adds to California Consulting’s depth and competency in the education grant writing area.